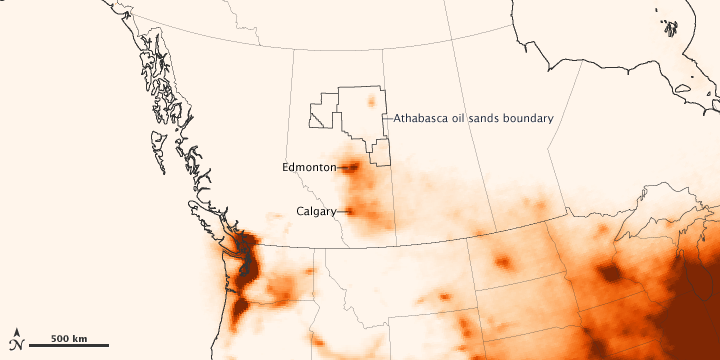 Using data from a NASA satellite, researchers have found that the emission of pollutants from oil sands mining operations in Canada’s Alberta Province are comparable to the emissions from a large power plant or a moderately sized city. The emissions from the energy-intensive mining effort come from excavators, dump trucks, extraction pumps and wells, and refining facilities where the oil sands are processed. Oil sands (also known as tar sands) are actually bitumen, a very thick and heavy form of oil that coats grains of sand and other minerals. Once extracted, that asphalt-like oil is partially refined so that it can be transported through pipelines to other refining facilities. 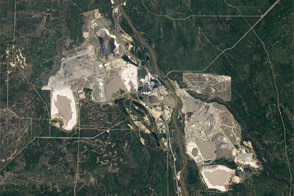 The top two maps above depict the concentration of nitrogen dioxide (NO2) in the air above the main oil sands mining operation along the Athabasca River, as observed from 2005 to 2007 (left) and 2008 to 2010 (right). The lower map shows those emissions in the broader context of the western provinces of Canada and the northern United States from 2005 to 2010. 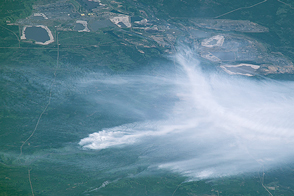 All data were acquired by the Ozone Monitoring Instrument (OMI) on NASA’s Aura satellite. Examining an area 30 kilometers (19 miles) by 50 kilometers (31 miles) around the mines, the research team led by Chris McLinden of Environment Canada found elevated levels of pollutants. Nitrogen dioxide concentrations over two of the largest mining operations reached 2.5x1015 molecules per square centimeter by 2010. The emissions had increased about 10 percent per year between 2005 and 2010, roughly the same rate as the growth of the oil sands industry. Sulfur dioxide concentrations (not shown above) peaked at 1.2x1016 molecules per square centimeter. The oil sands deposit in northwest Alberta covers about 142,200 square kilometers (54,900 square miles). Only 20 percent of the oil sands lie near the surface where they can easily be mined, while the rest of the oil sands are buried more than 75 meters below ground and are extracted by injecting hot water into a well that liquefies the oil for pumping. About 1.8 million barrels of oil were produced daily in 2010 from the Canadian oil sands. 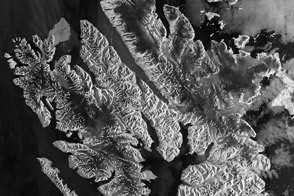 NASA Earth Observatory images created by Jesse Allen, using OMI data provided courtesy of Chris McLinden, Environment Canada and Ronald van der A, KMNI. Mining permit footprints provided courtesy of Matt Hanneman, Global Forest Watch Canada. Caption by Michael Carlowicz, based on reporting from the American Geophysical Union. Nitrogen dioxide emissions rise with the expansion of bitumen mining operations in Canada. American Geophysical Union (2012, February 22) Oil sands pollution comparable to a large power plant. Accessed March 1, 2012. McLinden, C. A., V. Fioletov, K. F. Boersma, N. Krotkov, C. E. Sioris, J. P. Veefkind, and K. Yang (2012) Air quality over the Canadian oil sands: A first assessment using satellite observations. Geophysical Research Letters 39, L04804. 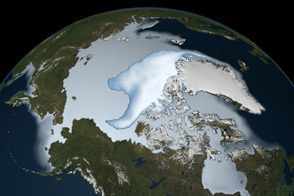 NASA Earth Observatory (2011) World of Change: Athabasca Oil Sands.